A laser cut badge made by a visitor to Longbridge Light Festival 2016. Digital Longbridge workshop with Bournville College students. 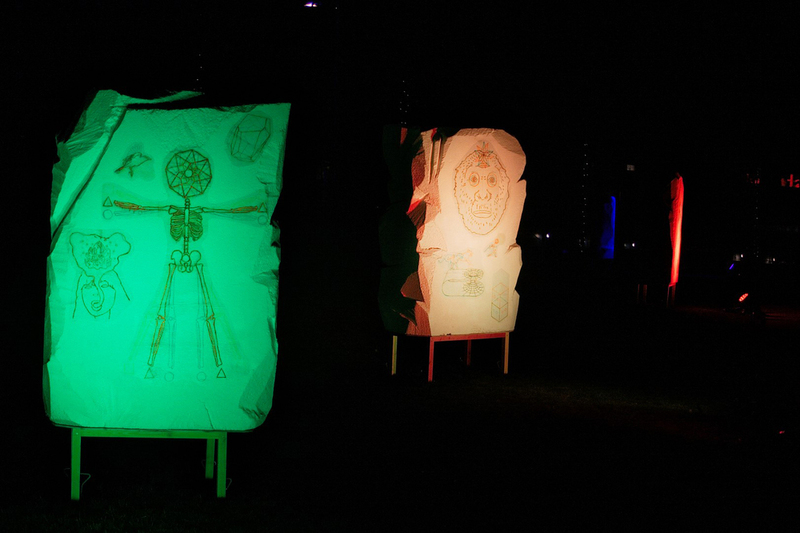 Work created as part of Longbridge Light Festival 2014. Birmingham City Council have designated Longbridge an ‘ITEC Park’ – an economic zone they feel best suited to delivering the information and communication services of the future. It is within this framework, and within the context of Longbridge’s extensive design and production heritage, that Juneau Projects’ ‘Digital Longbridge’ is being developed. Artists Ben Sadler and Philip Duckworth, working as Juneau Projects, bring together contemporary technologies with more traditional, handmade processes in almost all of their practice. Building up to the Longbridge Light Festival in 2016, they have held numerous workshops in the LPAP temporary project space and at other locations that tap into the wealth of ideas and skills embedded within Longbridge’s residents. At these workshops with groups of adults, young people and children – up to 200 people so far – the artists have invited participants to select a theme and design their own badges. 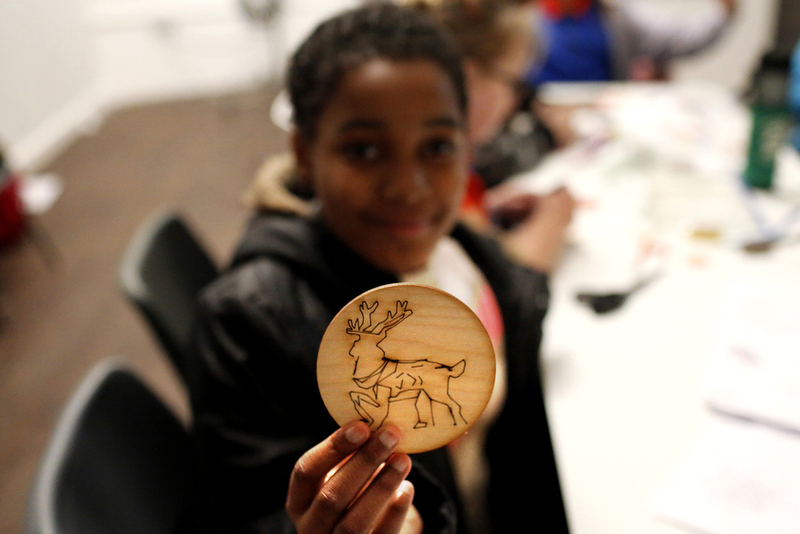 The workshops have transformed hand drawn designs into cut plywood badges using a laser cutter. These shapes can be painted and decorated by hand but will also act as triggers for digital animations when scanned with an augmented reality app on a smart phone. At the Festival, these will be artworks to be worn, disseminated, seen, discussed and interacted with – public artworks on a far more intimate and personal scale than might usually be expected. The badges will be distributed freely. Juneau Projects hope that scanning other peoples’ badges and unlocking animations will create new conversations at the Festival and beyond. These badges look to the future of Longbridge – they have been designed and made by its residents, based on their interests and ideas. ‘Digital Longbridge’ is, in this way, providing a social and cultural snapshot of Longbridge – this is a live research project that explores the creativity of the community. It is additionally equipping people of all ages with new skills. The open source animation software is available online as a free download and laser cutting machinery, for instance, is often underused by schools and college groups that own it. The project gives people tools to explore new possibilities for creative making and new possibilities for Longbridge. The skills learnt reach much further than immediate participation in the ‘Digital Longbridge’ project. It has been a very natural thing for Juneau Projects to work with local residents, especially given the heritage of the area. Alongside the badge project, the artists are working with a group from the nearby St. John the Baptist Church who have a history of making decorative banners. Together they are exploring how laser cutting may be a useful process for these women within the creative works they are already producing for their community. Juneau Projects are increasingly interested in collaboration and have worked to balance giving people a sense of freedom when making and ownership over the objects they have made without this process being overwhelming. Giving people the chance to work with a whole production process – from design to finished object – is a hugely valuable opportunity with obvious parallels to Longbridge’s manufacturing heritage. Juneau Projects are Ben Sadler and Philip Duckworth. They have worked together since 2001 and are based in Birmingham. Their work involves the use of a variety of media including painting, sculpture, music, animation and installation, often in collaborative and site-specific ways. They have exhibited nationally and internationally with institutions such as PS1, New York; Eichigo-Tsumari Triennale, Japan; Tate Britain, London and Ikon Gallery, Birmingham.